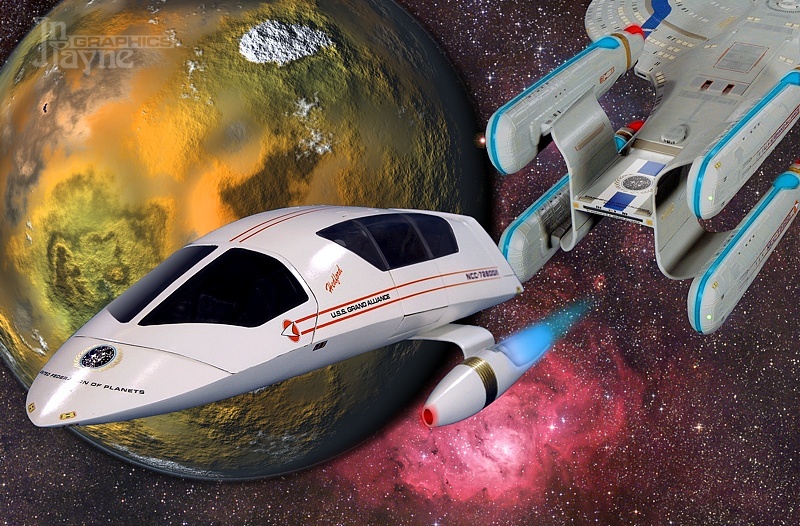 The USS Grand Alliance, Starfleet's Fast Diplomatic Transport starship, carries aboard a large compliment of shuttlecraft of various sizes and types, to service the needs of the VIPs she carries on important journeys. Shuttles Number One and two are the Alliance's "limousines." 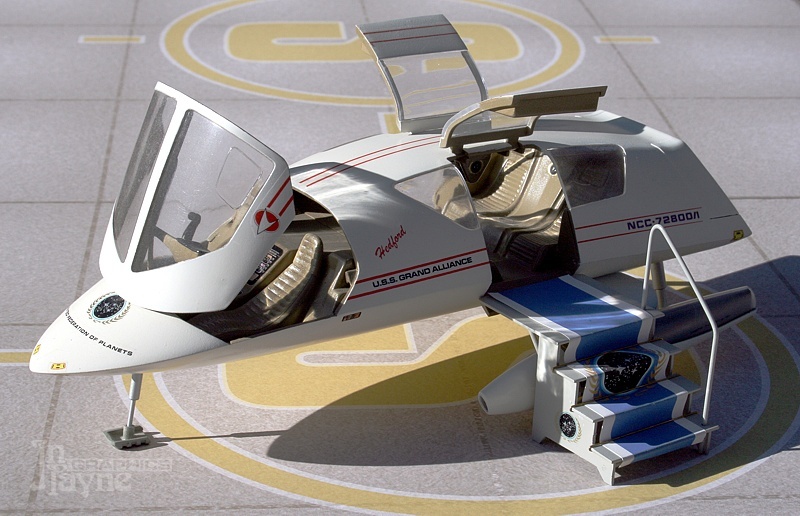 When an ambassador or other diplomat requires rerieval, one of these sleek, trim, 4-passenger shuttlea are sent. The craft have short-range warp capability with a maximum speed of warp six. Given the accomodations - seats, emergency life support for a few days max, and no sanitary facilities, long voyages are not in the mission profile. Here the Hedford climbs into orbit to enter the USS Grand Alliance's traffic pattern. As a diplomatic vessel, all of Grand Alliance's shuttles are named for noted politicians from many planets' histories. Shuttle One bears the name of Assistamt Federation Comissioner Nancy Hedford, who died while on a peace mission in 2267. Standing by on the shuttle pad at Starfleet Headquarters on earth, to loft some important dignitary to the Grand Alliance as she waits in orbit. to detail photos of the model..
to BLUEPRINTS or datasheets of some of these starships. to a profile chart of the ships in this section.. 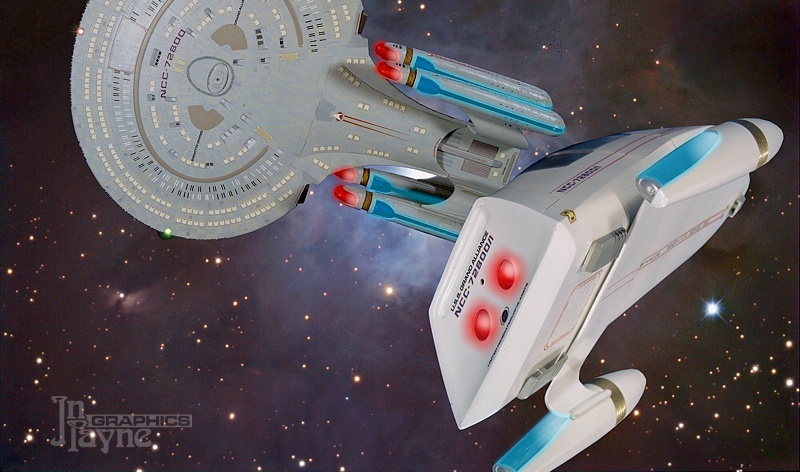 These model designs are Copyright © John Payne; Star Trek, Starfleet etc. etc. copyright © and/or trademark ™ Paramount Pictures, CBS and/or whoever else. These models are works of my imagination, and are posted on this site to share with other fans in a just-for-fun, non-profit fannish spirit in the same way as fan fiction. Please don't hurt me.